On September 14th Floyd Mayweather and Saul Alvarez will bring an unprecedented fight tally of 86-0 to the ring. With Floyd an eight-time world champion and Canelo the current unified light middleweight belt holder, it promises to be an epic encounter between two undefeated champions. We asked our followers if Mayweather v Canelo would be a closely contested bout and for their predictions on how the most eagerly anticipated fight of 2013 might play out. Presented below is a collection of responses we received from professional fighters, boxing journalists and fans of the sweet science. Money will do what (he wants), when he wants and might even hurt Canelo if his hands stick up ok. The bookmakers don’t often get it wrong! It will be slow with spurts of action, then a knockout punch by Canelo in the 9th. Gonna be an upset. Trust me! 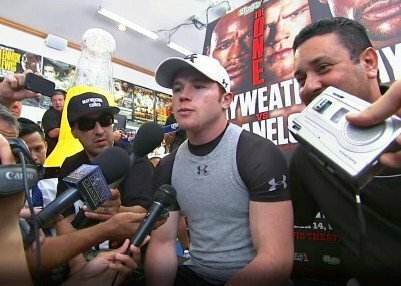 Massive gulf in class bar a big punch from Canelo. Definitely going to points. Mayweather won’t lose on points in Vegas. I think it will be a close fight. Floyd is an exceptional fighter. Great talent. But Alvarez is as strong as an ox. Going to be explosive! Competitive bout. Most people don’t want to see the skills Canelo truly does have. He’s been getting better and better. There is only one outcome. Floyd by unanimous points decision. Floyd by boxing clinic. Too fast. Too skilled. Too damn good. If Canelo tries to box, Floyd will school him. He needs 12 rounds of constant Roberto Duran pressure. Canelo isn’t that guy. Likes his own pace a bit too much in my opinion. Solid 12 round win for Floyd. Only father time can beat Mayweather and he might just show up on the 14th. However he needs to, Mayweather always finds a way. It’s a very competitive fight but it’s a year too soon for Alvarez. Mayweather is like a voodoo man, his mindset is too deep. On All Access Floyd’s looking older and slower, but it will need a high work rate to beat him. The boxing public is clearly split over the outcome of ‘TheOne’. With just over a week until fight night it won’t be long until we have the answer to the biggest fight of 2013.